North Korea's overseas restaurants, which the country uses to earn much-needed foreign currency, are feeling the effect of sanctions after the South Korean government asked its citizens to avoid them. As their customers vanish, the restaurants are having difficulty sustaining their profits, with some speculating that this is behind the recent defection of 13 North Korean restaurant workers to South Korea. Young North Korean women swayed in time to the beat on the small stage, wielding their saxophone, accordion and electric guitar, their kitschy sequin dresses reflecting the spotlights that illuminated the stage. 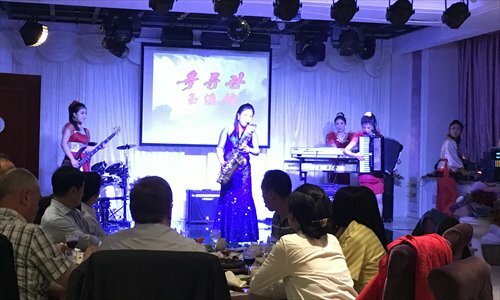 It was 7:30 on a Friday night, and the five-piece band was playing a modern rendition of a traditional North Korean song at the Okryugwan Restaurant in Wangjing, northeast Beijing. Opened in 2004, this is one of about 130 restaurants run by the North Korean government outside the country, 100 of which are in China, according to estimates. Apart from the nightly performances, the restaurants are also known for their dog meat dishes and young, pretty North Korean waitresses, dressed in colorful hanbok. What many patrons don't realize, however, is that the restaurants are also one of North Korea's major sources of foreign currency. The South Korean government estimates that Pyongyang rakes in around $10 million every year from them. But even in Okryugwan, the most famous North Korean restaurant in Beijing's Korean district, the effect of the sanctions against the country is taking hold. A Chinese cashier at the restaurant said they've been losing customers over the past few months. "South Korean tourists seldom come anymore, after - you know what," she said in a low voice, and winked when referring to the sanctions, apparently not wanting to bring up the sensitive word in a restaurant full of North Koreans. North Korea conducted a nuclear test on January 6, followed by a series of ballistic missile launches on February 7, March 10, March 18 and April 9 despite wide international condemnation. The United Nations Security Council unanimously agreed on March 2 to impose greater sanctions on North Korea. The sanctions order all North Korean imports and exports to go through thorough inspections and bans countries from buying a list of commodities from the country including coal, iron ore, gold and titanium ore. It also bans nations from supplying aviation fuel to the country that could be used for further tests. As part of the sanctions, Seoul's Ministry of Unification - which deals with matters related to the Democratic People's Republic - requested South Korean citizens not visit North Korean restaurants. "North Korea's commercial facilities such as overseas restaurants are one of its sources of foreign currency so the ROK government asks the Korean people to refrain from visiting such facilities during overseas travel," according to a statement on the Ministry of Unification website. Many believe the harsher sanctions are one of the factors that led to the recent en masse defection of 13 restaurant workers from an overseas North Korean restaurant to South Korea. The incident, details of which are still unclear, is putting a spotlight on North Korea's overseas restaurants. South Korean tourists used to be the main source of customers of North Korean restaurants in China's big cities. Li Zhengmin, an ethnic Korean who works as a freelance tour guide in Beijing, said visiting North Korean restaurants used to be one of the top things every tour group from South Korea wanted to do. "South Korean tourists feel nostalgic eating North Korean food and listening to Korean music. Famous folk songs like "Arirang" can almost always bring on a sing-along," he told the Global Times. But over the past two weeks, all the South Korean tour groups he has led said they wanted to skip the kitschy restaurants. "It's never been like this before - their level of concern about North Korean restaurants is very high, and they fear that visiting these restaurants will bring them trouble," he said. Jin Qiangyi, director of the Asia Research Center in China's Yanbian University, Jilin Province, said the situation of many North Korean restaurants in Yanbian is even worse. "Not just the South Koreans don't patronize them anymore, but Chinese people as well," he told the Global Times. Jin said this can be partly attributed to the increasingly unfavorable impression people have of North Korea in general, and partly to the growing effect of China's anti-corruption campaign, which bars government officials from patronizing these usually pricey restaurants using public funds. When the Global Times visited, the entire first floor of the Okryugwan was being renovated, and customers were guided to the second floor which used to be VIP boxes. Although a notice says the first floor will reopen on March 28, waitresses say it won't be open until next week due to construction delays. Waitresses here push customers hard to buy the more expensive dishes. If you order a beef bulgogi, they will very likely, in their accented Chinese, ask you to try instead the steak bulgogi which is "more juicy" - and three times more expensive. If you order a plain fish stew, they recommend instead the 399-yuan ($61.7) sinseollo, literary the "immortal pot" which is a broth famously enjoyed by the Korean royal court which features sea cucumber, shrimp and meat balls. Taedonggang beer, the "pride of Pyongyang," is also a must try according to the waitresses, and is priced higher than all the Chinese and German beer on offer in the restaurant. With their fair skin, elaborate make-up and charming innocence, it's sometimes difficult to refuse their requests. After repeatedly exchanging pleasantries and chatting with two middle-aged Chinese men by their table, one waitress successfully persuaded them to buy two bunches of plastic flowers, each costing an extortionate 100 yuan, and send them to the performers as a token of goodwill and China-North Korea friendship. "If you're going for the sake of the North Korean girls, it's a must go. But if you're going for food, please consider twice," goes one review for a North Korean restaurant in Putuo district, Shanghai, on restaurant reviewing site dianping.com. Professor Jin said these girls go through a screening process before arriving in China, and only those with the best appearance, artistic talents and political background are selected. "Many of them are the offspring of revolutionary heroes or party cadres," he said. Experts say the sanctions are putting more pressure on North Korea's overseas restaurants. "They have this system that every year, the North Korean government would ask for a large chunk of money from their revenue. It's called 'loyalty money,' and it's a big burden. With the sanctions, it's very difficult for these restaurants to fulfill their targets," Jin said. Many think the growing pressure might be one of the reasons for the recent defection of 13 North Korean restaurant staff who flew from China to South Korea. Chinese Foreign Ministry Spokesperson Lu Kang said in a press conference on Monday that the 13 DPRK citizens crossed the Chinese border with valid passports early in the morning of April 6. A spokesperson for the North Korea Red Cross Society said the 13 restaurant workers were "kidnapped" by South Korea, and asked for the South to return the staff, according to North Korea's Korean Central News Agency. The South China Morning Post reported that North Korea has now shortened the length of time that Korean restaurant staff spend working in China from three years to one year, and tightened selection criteria for workers. Although the defection is sparking speculation that the tough sanctions might be working, experts say it is yet too early to make any prediction. "All of them worked in the same restaurant, influenced by one manager, so even though 13 people are involved here, this can only be regarded as an independent case," Lü Chao, director of the North and South Korea Research Center at the Liaoning Academy of Social Sciences, told the Global Times. Professor Jin said this is the first case of defection after the sanctions, and more can be expected. But Jin also warns about South Korea's political motivation in revealing the defections - South Korea's 20th legislative elections started on April 13, and the defection of North Koreans is seen by some as a vote-winning tactic by President Park Geun-hye's Saenuri Party. Apart from the restaurant workers, Seoul also recently revealed that two senior North Korean officials defected to it last year. "Many defections are actually kept under the table by both the South and the North. So there could be a political agenda behind South's decision to reveal these defections right before the elections," Jin said. If this was the case, it was not an effective tactic, as her party lost the majority it held for 16 years, with domestic economic problems seeming to be the most important issue to voters rather than relations with the cousins in the North. Experts also said the number of North Koreans who attempted to escape their country by crossing the Chinese border have dropped in recent years, a result of Kim Jung-un's tougher border controls.